Parking: On street parking is available and is free of charge. Parking is available nearby at a charge of £7.50 per day. Perfect location above Portminster beach with a 5 minute walk down the hill. Fantastic room with a stunning view. Leslea is a fabulous host and has a lovely B&B she should be very proud of. Superb breakfast! Leslea was a warm and helpful host who made our stay in St Ives even more special. The B&B was beyond our expectations. Our room was gorgeous overlooking the ocean. The bed is very comfortable. The bathroom is spectacular. The B&B is in a quieter area with an easy walk to town. The breakfast was absolutely delicious. So many special touches. Thanks Leslea! Excellent standard of accommodation, facilities and service. Made to feel very welcome and special. Excellent dinner at the Portmeor Beach Cafe with fantastic view. Interesting visit to the St Ives museum too. The most luxurious bed and breakfast we have stayed at. The whole experience was a wow. From the moment we arrived...Lesley our host was both charming and accommodating. The accommodation was of an excellent standard. Our room was a big wow,with beautiful views across the bay and harbour. Breakfast was delicious.. Fresh fruit and yoghurt to start... Choice of cereals and a wonderful cooked breakfast. Will certainly be returning in a few weeks and next year for a summer holiday. If you want to stay somewhere with the most fantastic view this is the place, spotlessly clean, superb breakfast and great host. Excellent all round. 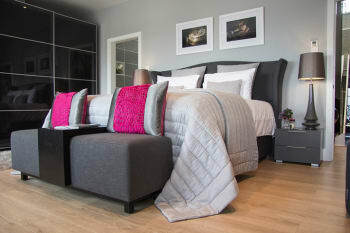 Luxury accommodation which was spotlessly clean. Great location and friendly hosts. Great breakfast. Couldn't fault anything. Nothing was too much trouble. Absolutely Fabulous on all counts. Hospitality fabulous. We stayed in room 1 which was outstanding. Breakfast was first class. Thoroughly enjoyed our stay and Lesley and Sam were so attentive and welcoming. Thank you for a fantastic stay and sharing your beautiful home with us. Beautiful B&B, Leslea was so friendly and welcoming we had a fab weekend and can't wait to return. In room facilities of high quality and lovely touches such as Molton Brown toiletries. Breakfast was beautifully presented and very tasty! Amazing views over the sea and the whole of St Ives, especially enjoyed while having a drink on the balcony. Portminster cafe is pricey but well worth it for the fresh seafood and views of the sea. Make sure you book a table at any of the good restaurants in town in advance if visiting over a bank holiday as they are all fully booked! Tate St Ives was closed when we were there, but the Barbara Hepworth Museum is well worth a visit. Eating at the Porthminster Beach Cafe (only a few steps away from Pretty Penny) is a treat not to be missed. Myself & my wife have just returned from the Pretty Penny B&B in St Ives after a fantastic 7 night stay. 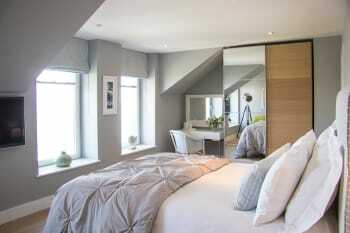 The accomodation has to be the best in St Ives with fantastic views of St Ives Harbour. 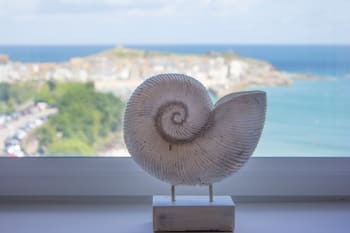 You are ideally based to walk to into the centre of St Ives which is a short stroll either along the beach, Coastal Path or the main road at the top all taking approx 15 minutes stroll. The hospitality is first class from Leslea & Sam. There are plenty of Restaurants to choose from catering for all tastes & pockets. The beaches are superb & plenty to choose from. There are many little streets with shops, restaurants, cafe's & bars to suit all tastes. We stayed for 4 nights during september in room 2 & wow the views are amazing. The accomodation is fabulous, impeccably clean, a joy to come back to . Leslea is a fantastic host, very welcoming , just a lovely person. The walk to the beach is only 5 mins , although its a climb back up a steep hill, its well worth it! The breakfast was great, everything you wanted & more. We truly enjoyed our stay & have fallen in love with St Ives. We hope to return very soon. Great location for visiting most of the attractions Cornwall has to offer. Fabulous B&B. sea view is amazing. Room we stayed in was very spacious and of high quality. Leslea could not do enough for us and was very informative with places to go and see. Would recommend. Beautiful rooms and lovely hospitality. Would recommend this unreservedly. Top of a steep walk - which helps to burn off the Cornish pasties but can be reached along the top if you have trouble with slopes.